Personal Trainer, Andy Hosier, uses personal experience to help clients gain momentum for weight loss, increased energy and lean muscle mass, and better health. I connect with individuals to identify their personal goals and adjust my training philosophy to fit their objective & timeline. 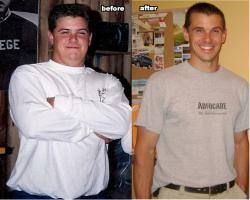 Obesity survivor turns personal trainer and bootcamp instructor after life changing event and dedicates his career to helping others achieve lasting results.